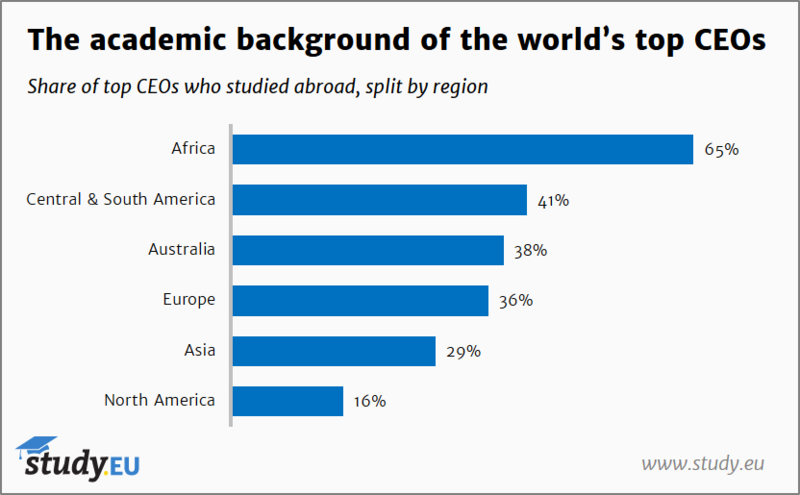 32% of CEOs study abroad, is their success linked to study abroad? Tagged with CEO, Study abroad, Study.EU. A study of CEOs from some of the world’s largest companies (as per the Forbes Global 2000 rankings) has found that around a third of the most prominent executives in the business world benefited from international education. 32% of these leaders chose to spend at least one semester of their university-level education overseas. 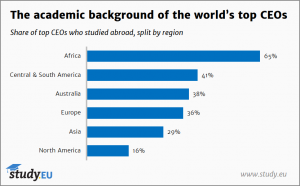 The research by Study.EU breaks down the findings by the location of the companies in which the interviewed subjects work, and thereby shows that African CEOs are almost twice as likely to have studied abroad that CEOs operating in other regions. 65% of those interviewed in Africa have studied abroad. In comparison, 41% of the surveyed executives in Central and Latin America had experience of mobility, 38% of Australian CEOs, 36% of Europeans, 29% of Asian, and 16% of North Americans had studied abroad. The research reveals what some may already assume: that top level executives are generally well-educated. Worldwide, 97% of CEOs hold a bachelor’s degree, and more than 60% hold a master’s or MBA, too. But the research also sheds light on which global business leaders are the most educated, with 100% of Chinese and Indian CEOs graduating with a bachelor’s, and 33% of the surveyed Chinese reporting doctorate level degrees. Despite the high levels of higher education among Asian CEOs, only 27% of Chinese CEOs were mobile as students, and even fewer, 19%, of Indian CEOs had international study experience. However, it should be noted that according to the authors of this study, the CEOs from all of the areas surveyed outstripped the average levels of student mobility by some distance. The average is only 6% of all students, meaning that even in the region with least mobility (the USA, 11%) CEOs were significantly more likely to study abroad than other graduates. CEO of the reporting organisation, Study.EU, Gerrit Bruno Blöss, said that by studying abroad, chief executives were widening their perspectives on the world, allowing challenges to be faced from less traditional viewpoints. MBAs make up a significant proportion of the higher education qualifications held by CEOs. In the Americas (central, north, and south) a full two-thirds of CEOs with a master’s level qualification hold MBAs. CEO of the Association of MBAs, Andrew Main Wilson, told The PIE News that the results of Study.EU’s survey are “positive news”, and the global nature of modern business means international experience is more important than ever for business leaders. “The internet, connectivity and international business have made the world a village,” he said. He added that in AMBA’s own research, 34% of respondents undertook an MBA to “increase their chances of succeeding internationally”. He added that this ‘global village’ atmosphere of business in 2017 is a challenge to business schools and MBA providers, as well as CEOs and those working in the industry. “These findings challenge MBA providers and business schools to increase their global networks and universities working ever-harder to attract international students. These global networks are essential to business schools and one way of establishing strong and lasting networks is to establish partnerships,” Main Wilson said. I find it very interesting that only 10% of North American CEO’s have studied overseas, while other countries considerably higher percentages. I hope this research helps spread the word to students in North America that they need to spread their wings add some international experience to their resumes.